Turn out the lights and put on your dancing pants. A black light is a type of bulb that emits UV-A light but not significant light that can be seen by the naked eye. It typically is surrounded by violet-tinted casing that blocks the light, and as such, it gives off merely a mild purple glow. It's not exactly black, but it's as close to a black light as you're going to get. These are fun lights to have at a club or a gothic seance to bring back the dead remains of a beloved hamster. 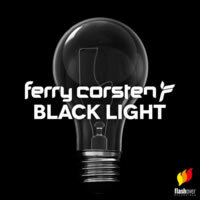 In the music world, however, Black Light is actually the name of a 2013 track by trance legend Ferry Corsten. We only get an Original Mix in this package, but frankly, that's about as many mixes as I can handle of this. After a brief reverbed intro of someone playing with springy instruments, a deep bassline rustles in to shake things up. Monotone fuzzy synth jabs sneak in to lead the way for a while, and it all sounds like an evil brew in a rusty cauldron. Maybe Ferry was having a rough day and let out all his feelings on a synthesizer. Things later get a bit more normal with a siren-like synth blaring at as high a volume as it can go before provides instant tinnitus to home listeners gives us the official melody. It's very simple, but combined with the thumping of the bass, it's eerie. Just plain eerie. And just when you think the track has reached its plateau, Ferry waltzes in with a dirty, gritty bassline to add to the oddity of this track. I'll admit: Mr. Corsten is all over the place here, throwing everything he can at us in one electro splash. It's unusual, to say the least. This one would never qualify as my favourite track by a longshot, as it relies too much on dark sounds over substance, but it's at least club worthy and would be a swell change from the typical hands-up, booty-out mixes I've been hearing lately.